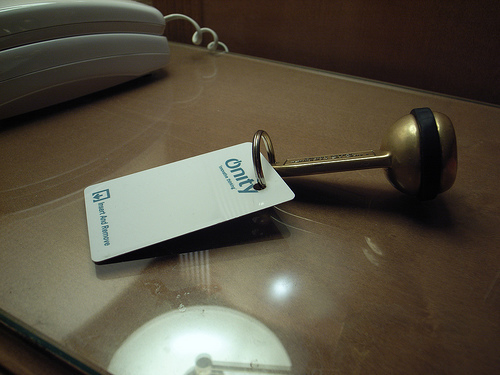 - the stability of the past: this old and commong keyring which is so heavy that you would not keep the rfid key in your pocket during a whole day: you must put it back at the hotel desk when you get out (delegation in design). The flat, sober and white plastic key and the old copper keyring. 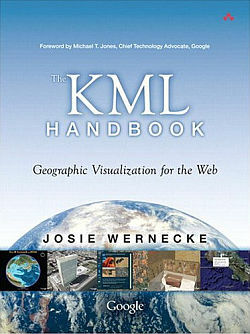 Near the end of last year, the new book "The KML Handbook: Geographic Visualization for the Web" by Josie Wernecke was published. Josie is a Google documentation specialist who works for the Google Earth team. During the holidays, I received a copy of "The KML Handbook" for review. Click on the book image for more details on the book including prices at Amazon. The book has a foreword by Michael T. Jones, Chief Technology Advocate for Google. Most long-time Google Earth folks know Michael has long been the chief advocate of Google Earth and was in fact a big part of the original team that created it. In the forward, Michael makes an excellent case that KML, as a way for annotating the world, can be used to change the world. And, in fact, through Google Earth, KML already has helped change the world. Since this is a technical book about a standardized language similar to HTML, you might expect a lot of dry technical jargon with lots of coding examples. But, this book is nicely illustrated with many Google Earth color screenshots throughout the book. And, the illustrations aren't simple examples of basic KML functions. They illustrate many popular KML files by developers around the world which in most cases have appeared here at GEB. Examples like Valery's paleo-geographic animation, James' London Eye with shadows, and even Stefan Geens gets some KML photo examples in there. For KML developers, or those who want to learn the language, this book is an easy read and well organized. It provides enough detail to get you started, and enough of an overview to expand your awareness of the many possible applications of KML. And, with many useful examples and colorful illustrations, the book keeps you fully engaged. It serves its purpose as a handbook for KML, but for in-depth KML details you'll still want to use the online KML reference documentaiton. Josie helped prepare the complete online KML documentation which provides all the information you need about KML. But, for those who prefer the familiarity of a good book in their hands, or want to learn the subject while on a long trip or night time reading, you can't do much better than "The KML Handbook". I highly recommend this book if you're looking for the best available written material on KML. Un livre technique qui documente le language standardisé KML (Google Earth & Sketchup). Je soulignerais en particulier cette phrase tirée du post de Frank Talor: "(...) In the forward, Michael makes an excellent case that KML, as a way for annotating the world, can be used to change the world. And, in fact, through Google Earth, KML already has helped change the world. (...)". Un langage informatique, qui plus est un language permettant de décrire des situations "virtuelles" et qui permettrait de changer le monde? Eh bien oui, en partie.